A local voluntary community organisation that offers peer support groups and activities for our local military and blue light service personnel and veterans. Trafford Veterans was formed in 2015 by a group of veterans from H.M. Armed Forces and Emergency Services. In the beginning, our group attended local community events, so that people could become aware of who we are and how we could help individuals within Trafford. 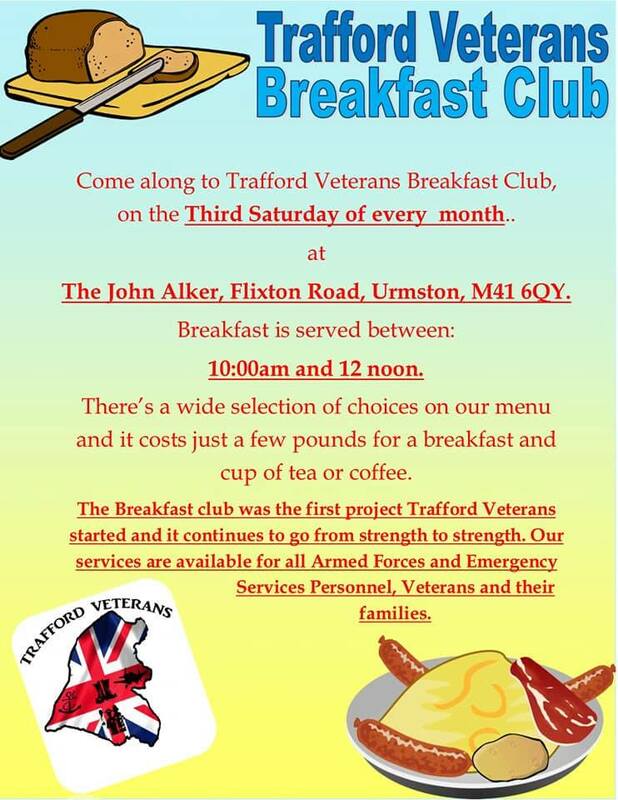 Our first major event took place in December 2016 when we held our very first Veterans Breakfast at The John Alker in Flixton. The event was a huge success and people travelled from various places to show their support for our new venture. From then on, it was decided that would do a veterans breakfast on a monthly basis on the third Saturday of the month. As time has gone on, we have grown from strength to strength building up our services and will continue to build them up in the future.